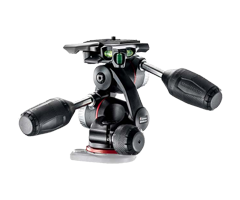 The MHXPRO-3W 3-Way Pan/Tilt Head from Manfrotto is a compact pan/tilt head with retractable handles that can be extended as needed. Two knobs control the friction for the front-to-back and side-to-side tilt, allowing you to fine tune the movements based on the weight of your gear. Three leveling bubbles ensure your composition is level on all axes.